A keeper is a vital member of the defense, molding his play with the other defenders, keeping aware of every­thing they do and letting them know what he is doing all the time. Any team looking for success is going to find it difficult without a good goal­keeper. An important subject in goalkeeping is when to leave the line, which is considered to be the area directly in front of the goal. This judgment will determine the difference between the good keepers and very good keepers. Young players who seem to be aggressive and are not afraid of contact can be good candidates to become future keepers. 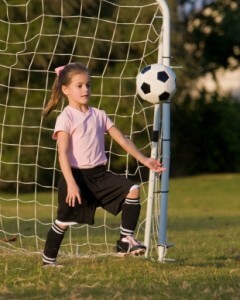 It’s rare to find a kindergarten or younger player that takes to aggressive soccer drills that are found in goalkeeping practices. Let the keepers on your team know they are the eyes and ears of the team and are the directors of what happens. Give them this control and it will help their confidence tremendously. Basically, there are two reasons for the goal­keeper to leave his goal. A goalkeeper who hesitates in these situations will not get the ball nor will the other defenders know whether to cover him or go for the ball themselves. On the other hand, a goalkeeper who is confident in his approach will leave no one in doubt as to his decisions. He’ll call to let his teammates know what he wants, whether demanding for them to clear the ball or clear the way and give him cover because he is leaving his line for the ball himself. Now another decision needs to be made and that’s whether to catch the ball or punch it away. There are two basic techniques a keeper should spend time practicing. 1) The first technique to master is that of catch­ing the ball overhead. This is a difficult technique and special care must be taken when catching in this manner. Since the hands are the last line of defense, a goalkeeper is in trouble if it slips through. As for practicing, have 2 keepers throw the ball to one another so that the ball arrives overhead and has to be caught and brought to the chest before being thrown back in the same way. This is a very basic, but necessary to simply get the feel of the ball. It can be made more interesting and more difficult when one of the goalkeepers catches the ball while moving backwards, the ball now being thrown just that little bit harder and higher so that it is dropping to the back of him. 2) The second technique involves developing punching ability. Practice on a suspended ball. The ball doesn’t have to be too hard, so that contact can be made without harming the knuckles. Have the keeper fix his eyes on the ball and aim dead center. When he moves for the ball, he should take off from one foot, bending the other knee up in front for protection. He should keep his arms bent so that the fists are ready for contact. The fists should be held close together presenting a wide area of contact. Sometimes, practice should include the use of one fist because it’s not always possible to get two fists to the ball when penalty areas are very crowded and there’s a lot going on. Defenders will respond to a positive goalkeeper. He can make them more efficient players, and he must possess the confidence to inspire the players in front of him. For goalkeepers, confidence and leadership are a must. Master the aggressive keeper tech­niques of catching and punching, and your team is well on its way to success.